Rated 4.5 out of 5 by 71 reviewers. Saved my dog from the needle! Stopped the Accidents and dribbling but she wouldn't take the pills. Sending in a prescription is not the best way to order. Seems to work 90% of time. Proin has been a lifesaver to help my senior dog Ally. Effective From The Very First Dose! Great prescription for a weak bladder. All around, very good results. This product works for our dog. works well and she loves it. 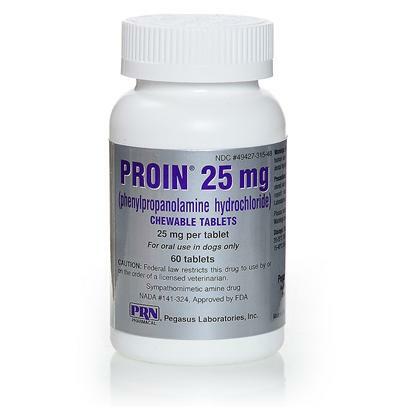 Proin eliminates incontinence in neutered female dog.